Everyone knows Vassar was built on a foundation of malt, barley, hops, and yeast. 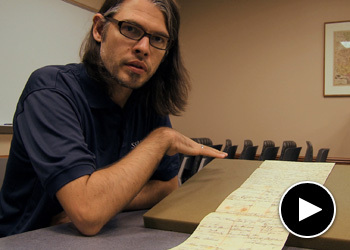 But what was the recipe for Matthew Vassar’s famous ale? Matthew Vassar was able to establish the college because his brewery on the banks of the Hudson River in Poughkeepsie was a wildly successful enterprise. But until this semester, Vassar students were never asked to investigate exactly how Matthew made that popular ale or how they might brew a reasonable facsimile of it. 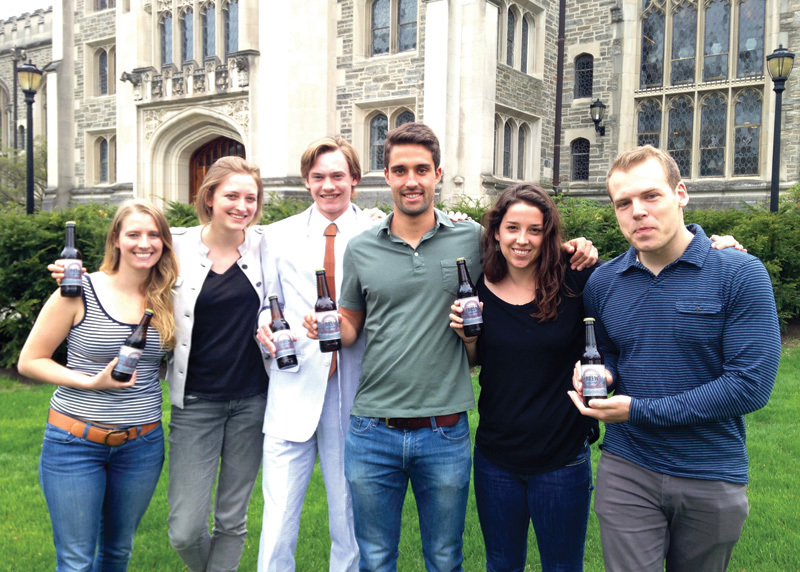 This Senior Week, students of legal drinking age were able to sample an ale concocted by six students in a class titled “Matthew Vassar’s Brew,” taught by anthropology professor Lucy Johnson. The idea for the class first began, well, brewing in Juliano Pereira’s mind during his sophomore year in 2012 when he went on a field trip to downtown Poughkeepsie for a local history class taught by now retired professor James Challey. When Pereira and some of his friends approached Johnson last fall about creating such a course, she told them it would have to be about more than just brewing and tasting beer and ale. “I said we’d be doing a lot of reading, learning about the history of beer making in the Hudson Valley, reading Matthew Vassar’s papers in the college archives, and also investigating the current state of brewing in the region,” Johnson says. One of the first things the class determined was that no printed records of M. Vassar and Co.’s recipes for its ales still exist, if indeed they ever did. “Back then, brew masters did a lot of experimenting, and they rarely wrote down specific recipes,” says Lisle Schaeffer ’14, one of two members of the class with some experience in home brewing. Madeline Szkobel-Wolff ’14 is the other. 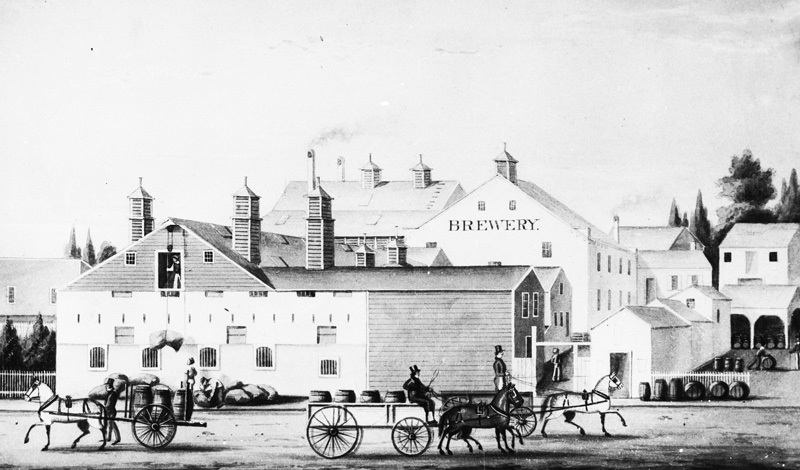 Schaeffer says he and Szkobel-Wolff were able to find plenty of data about how classic English ales were brewed in the United States in the early and mid-19th century. And they found a Facebook page and blog called the Albany Ale Project, whose writers had obtained records of the ingredients Vassar’s brewers purchased in the 1840s and 1850s. By calculating the ratio of the grains, malt, and hops Vassar’s brewery had bought and comparing it to recipes for other English ales being brewed at the time, the students are reasonably sure they’ve come close to the formula Vassar’s brew masters employed. One thing they discovered when they made their first test batch, Schaeffer says, is that the ale that came out of Vassar’s brewery was stronger than most beers and ales on the market today. “The flavor of the hops is really powerful, more than most people like,” Pereira says. So in addition to the ale they call “Matthew’s Brew,” the students also made a batch they call “Matthew’s Brew Lite.” They mixed the ingredients in Schaeffer’s kitchen in the Townhouses in mid-April. After fermenting for about two weeks in small vats in Schaeffer’s closet, it was ready for bottling in time for its official unveiling during Senior Week. The specially designed label features a likeness of Matthew holding a tankard of ale while standing in front of Main. M. Vassar and Co.’s ale gradually went out of style not long after the college was established, the students learned. Derek Mraz ’14 says research he and Szkobel-Wolff did during the course revealed that the new wave of Dutch and German settlers who arrived in the Hudson Valley in the second half of the 19th century generally preferred beer over ale. “They wanted something closer to the lagers that were being made at the time in Holland and Germany,” Mraz says. Indeed, by the 1890s, M. Vassar and Co. was nearly out of business. A Taste of Vassar History! This is not the first time someone has tried to recreate Matthew’s brew. In 1992, in celebration of the founder’s 200th birthday, a group of administrators set out to piece together the recipe for the historic ale. A brewery in Kingston, New York, took up the challenge. As Vassar historian Colton Johnson recalls, the brewer said the high alcohol content of the recipe “would likely put out the lights of modern beer-drinkers in no time.” The college ordered 40 kegs of Matthew’s brew—reduced in strength. Today, Matthew’s brew continues to inspire a new generation of home brewers. Chad Fust, a homebrewer who works in Computing and Information Services at Vassar, talks about his adventures in deciphering Matthew’s brewing logs. Over spring break in Japan, Vassar choir members joined singers, dancers, musicians, and theater artists from four continents for a special musical collaboration between the college and the Ashinaga foundation. Professor of Art Peter Charlap's paintings of Texas death row inmates are more than just humanizing portraits—they're calls to action. Vassar's collection of papers from the estate of Frances Scott “Scottie” Fitzgerald ’42 reveal the breadth and depth of Scottie’s own life, apart from her famous parents—F. Scott and Zelda. Will Max Fagin Go to Mars?